Robert Thomas Maitland was born in Maryborough and enlisted in the R.A.A.F. in WWII where he qualified as a Wireless Air Gunner (WAG). Bob was involved in 84 operations on Catalina aircraft (flying boats) during the war. At the end of the war he was a crew member of the Catalina which flew General Thomas Blamey on his visits to various allied bases in the South West Pacific. To commemorate the trip, members of the crew were presented with a Samurai sword and bayonet. 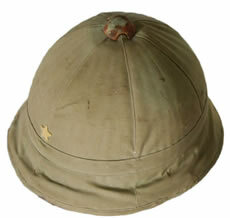 This Japanese sun helmet is a very rare piece of equipment as not many survived. It is designed to fit over the steel helmet and when the steel helmet was not required, the sun helmet was worn as protection from the elements. Also on display is a Nazi helmet, a Luger pistol, a German water bottle and a bread bag. This bronze figurine typifies the hardships endured in the New Guinea jungle campaign. A relic of the North Africa Campaign, these trousers were worn by a member of Rommel's German Afrika Korps.